We discuss each skill level on the riding and training trees as though we master each separately, one after another, in a linear progression. The reality is that these skills are interrelated. You cannot FULLY master an individual skill without relying to some degree on the others. This gymnastic complexity is particularly true of rhythm and relaxation, the basic skills required for any riding or training program. Rhythm and relaxation are the first two skills a horse in training must master. Relaxation is the first thing the rider in training must master. Mastering both often presents instructors and riders with a chicken and egg conundrum. If rhythm or relaxation is missing, what is the problem? Is the horse's rhythm off because of a stiff joint or are the rider's stiff joints blocking the horse? Is the rider tense and uncomfortable because the horse acts spooky or is the horse spooky because the rider's bracing and gripping makes him uncomfortable? We start beginning riders on goldie oldie school horses for a reason. A reliable, predictable horse allows a rider to relax so he or she can concentrate on developing balance and feeling the horse's motion without any mental anxiety to create muscle tension. 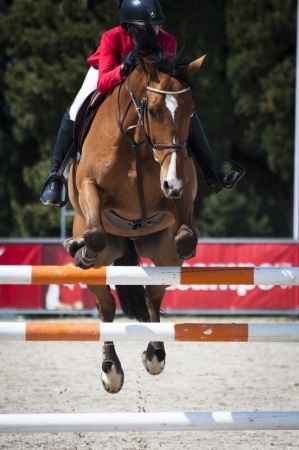 Without balance, the rider cannot relax because she will constantly be gripping and grabbing to stay on the horse. If a rider holds tension anywhere in her body, the horse cannot relax. For example, the horse will lock muscles in the neck and jaw if the rider uses the reins to balance. And here's that chicken and egg thing again. As the rider learns to balance correctly, follow the motion of the horse, and coordinate aids, her ability to stay relaxed even when the horse is not increases. Along the way up the riding tree, mastering relaxation is always a work in progress. The riding and training trees outline physical skills riders and horses need to master. Just as important, however, is the emotional skill of mastering fear. Fear is not necessarily a bad thing. It can be a useful tool in making choices. What we don't want is a level of fear that overrides our ability to stay cool and calm in the moment. Mastering fear is essential to mastering relaxation. We master fear the same interrelated way we learn physical riding skills. We start on a quiet school horse with rhythmic gaits until we have basic mastery of balance and following the horse's movement. Then we continue to improve those skills and our confidence in them by moving on to progressively more challenging mounts. We move on from that quiet, dependable horse to those that may be taller or shorter, wider or thinner, have quicker gaits or a bit fizzier personality. A good instructor helps students progress incrementally so that they develop both a solid seat and emotional confidence. When a scary situation develops, the goal is to acknowledge in your mind that you feel fear but to avoid any physical reaction that communicates that fear to the horse. In other words, "Never let them see you sweat." Mastering this emotional level of riding takes lots of time riding lots of different horses. Certainly a fearful, anxious horse makes it more difficult for the rider to relax. But fear is not the only enemy of relaxation. Physical pain in either the rider or the horse can make it hard to keep muscles soft and relaxed while working them. 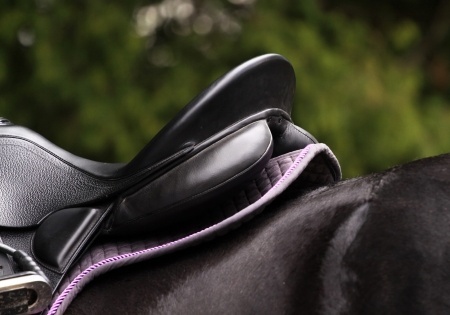 Saddle fit, for example, can be the culprit when rider or horse has relaxation issues. A rider may have the best seat in the world but if the saddle does not fit her because it is too wide or too narrow for her hips, the discomfort will affect the rider's ability to relax. If the stirrups hang in the wrong position the rider will have balance problems (and that 'off balance' feeling in itself can feed a rider's fear - everything is related). The same is true from the horse's side of the equation. The horse cannot work with relaxation if the saddle rubs or pinches uncomfortably. A saddle that fits both horse and rider perfectly can seem like the Holy Grail. And budgets affect riders' choices. But the right saddle is worth the search. Borrow saddles and try as many as you can. 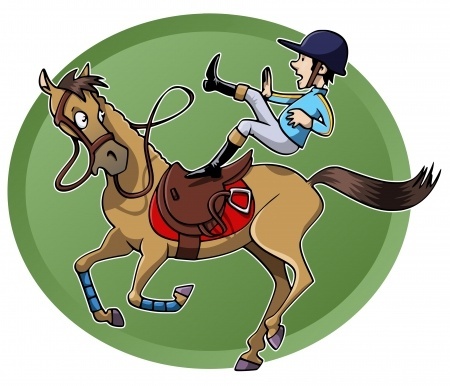 Notice how each affects your riding and your horse's ability to relax and move freely. Some instructors have saddle preferences, especially for students who show. 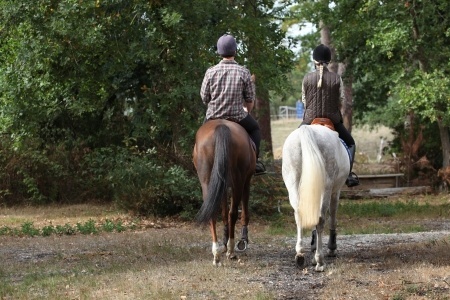 Never, however, be pressured to buy a particular type or brand of saddle if it makes you or your horse uncomfortable. The saddle that is perfect for one horse and rider may be a really bad choice for another. It may sound like an oxymoron to say that we want the horse to work with muscles that are both relaxed and held in tension, but that is what an athletic horse does. Working muscles tense and relax repeatedly as they move the horse's joints through their range of motion. We want the feel of rhythmic tensing and releasing, tensing and releasing. If the horse tenses a muscle then holds that tension rather than releasing it immediately, he has lost relaxation and he will lose his rhythm, too. Think of the feel the horse gives as he spooks compared to the feel of a horse trotting or jogging beneath you with relaxed poll, jaw, neck and back. As horses and riders move up the training and riding trees, both must master the feel of working with muscles held in 'relaxed tension' in the sense that they are working elastically without being locked or rigid. The bottom line is that we, as riders, are responsible for establishing and maintaining rhythm and relaxation in our relationship with the horse. This demands a great deal mentally, physically and emotionally. Instead of thinking about learning riding skills in a linear fashion, it may help to think of mastering them in a progressive upward spiral. You learn to ride with relaxation and balance on one horse with a particular way of moving and a particular mental outlook. You move to another horse and find yourself 'relearning' those same skills because this new horse's way of moving is different in another way. The next horse challenges your mental confidence because he is a little more unpredictable. Like life, learning to ride is a journey. Challenge yourself incrementally to build your physical skills and emotional confidence to the point where you can ride any horse without sweating. Enjoy the journey!